Card Catalog? What’s a Card Catalog? Library research has changed dramatically since 1983. Or has it? I pondered this question while looking at books to add to the CHP collection. 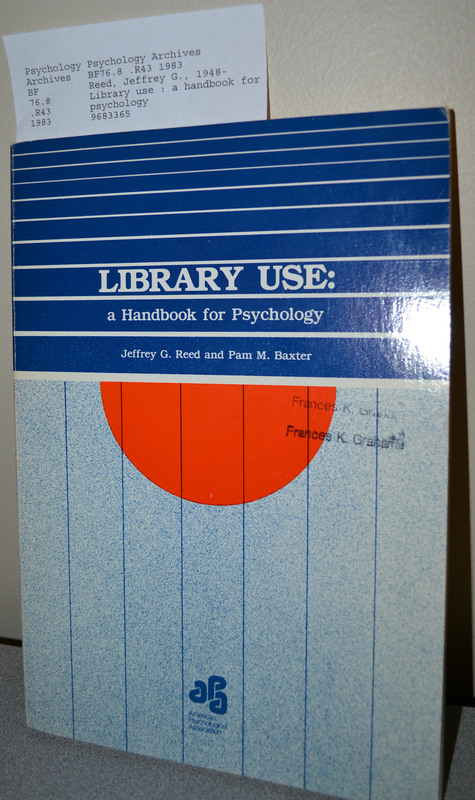 I discovered this book: Library Use: A Handbook for Psychology by Jeffrey G. Reed and Pam M. Baxter (1983), donated by Francis Graham. The recommendations in this book for finding sources vary from current methods. 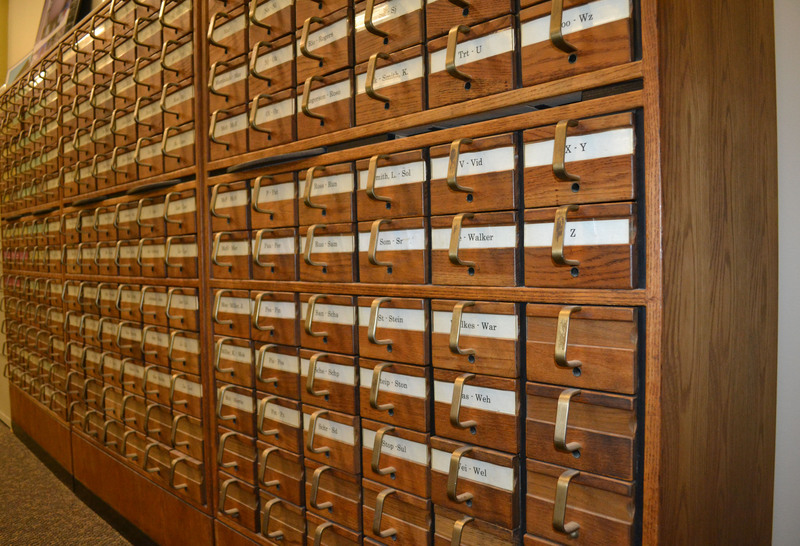 For example, there is an entire section on locating a book, which covers using the card catalog. Remember these? The 3”x5” cards contained author, title, call number, publishing information, and subjects. Researchers physically flipped through the cards, organized alphabetically by title, author, or subject. Library Use briefly mentions computers but clarifies that “most computer searches are done by a librarian experienced in the use of computer databases” (page 92). While the approaches may have changed because of technology and the internet, basic information and methods haven’t changed as much. For example, the online library catalog contains the same information that is found on those 3”x5” cards. Researchers type in title, author, or keywords, rather than flip through cards. Also, Library Use offers this advice: “start early, allow yourself plenty of time, and avoid the end-of-the-semester rush” (page 14). Still true! I added Library Use to the University of Akron Libraries online catalog, where you can search for other books in the CHP collection. Why does the CHP keep this book, if some of the information is no longer relevant? The book itself is a piece of history. 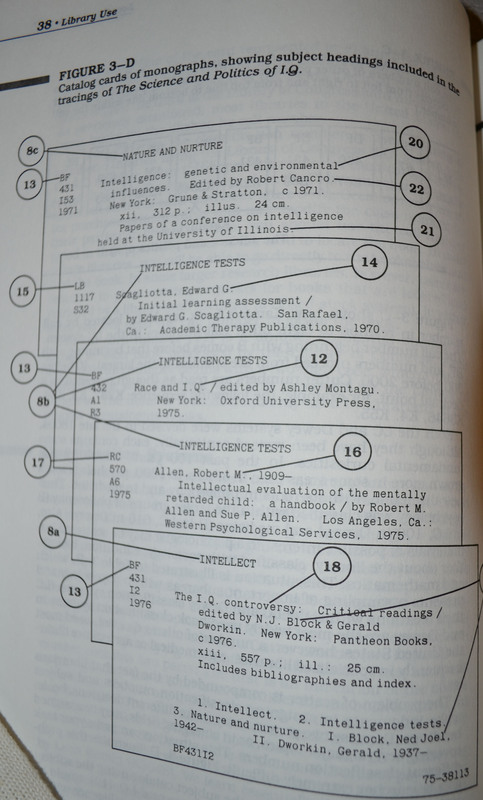 It documents not only how psychologists conducted research, but how libraries functioned before the widespread use of computers and electronic databases. And, for those who remember, the card catalog may bring back a bit of nostalgia. It’s Friday! Who Wants to Play Gobolinks? While scanning CHP photographs of various apparatus and psychologists, I found a fun game buried in the collection, and I wanted to share it: gobolinks! It’s not hard – you need ink, a piece of paper, and imagination! It’s like an inkblot, but it’s purpose is amusement rather than psychological analysis. First you drop some ink onto the paper, and then fold the paper in half. Unfold the paper, and look at the design that you just created. Do you see an animal? A mask? A goblin? Whatever you see in the ink blot you created, now comes the fun part: write a brief poem telling the story of the image that you see. 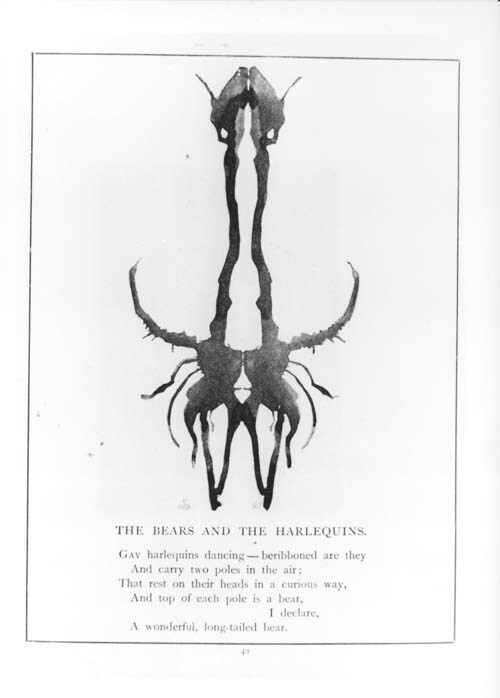 This used to be a game that people played in the 1800’s, where several people would all create a poem on an image and an appointed judge would read all of the poems, study the ink blot, and then choose a winner. 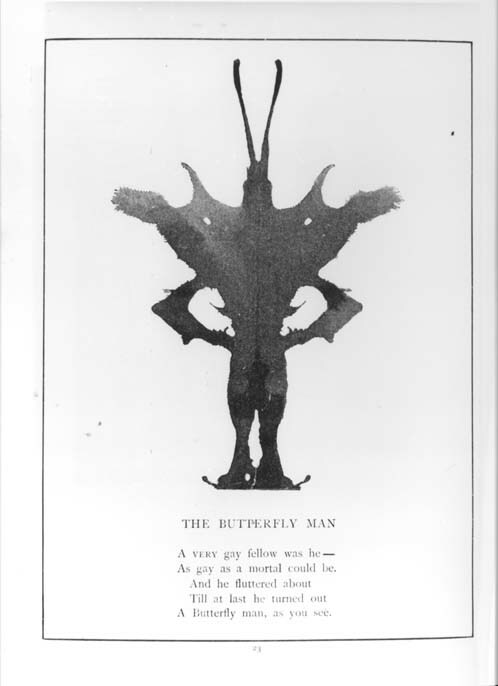 Take, for instance, “The Butterfly Man.” I can see the image that someone had in mind when they saw their ink blot. Can you see the Butterfly Man? However, there are some gobolinks that are more complex, like “The Bears and the Harlequins.” If I squint, I can see it, but the creator must have had a vivid imagination! I find these gobolink images to be very amusing, I think we should bring them back as a party game! Would you play this with your friends? For more information on gobolinks, the Center for the History of Psychology has some in the still image collection or you can find a copy of Gobolinks or Shadow Pictures For Young and Old by Ruth McEnery Stuart and Albert Bigelow Paine. Michelle Breckon is a practicum student from Kent State University’s Library and Information Science program. She is working with the Center for the History of Psychology’s still image collection.